NACHC is monitoring reports about the fires that have devastated communities across northern and southern California, particularly the Camp Fire in Butte County and the Hill and Woolsey fires in Ventura and Los Angeles counties. 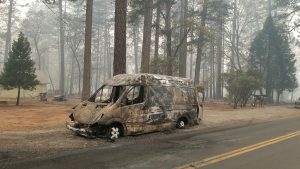 The Camp Fire has killed 42 people and more than 200 residents remain missing. The blaze, the most destructive and deadliest wildfire in California history, has destroyed more than 7,000 homes and businesses, mostly in the city of Paradise. 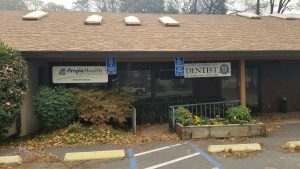 Ampla Health, located in Yuba City, CA., is among the health centers that were affected by the fires and sent us these photos of their site in Magalia, just seven miles north of Paradise. Amazingly, the health center appears to remain standing after the fire, despite being surrounded by the charred remains of other structures. Part of the roof is missing, and conditions inside the building are not yet known. But more important is how the staff of Ampla responded to the needs of residents, keeping their doors open at nearby sites and even volunteering to visit the shelters where families have fled with their belongings, providing N95 masks, conducting outreach activities to inform the victims of the services and programs at the health center and donating personal care items to people in need. This, despite the fact that the health center staff were themselves victims of the blaze. “The tragic news is that 13 of our Ampla Health family members who live in that area lost their homes – including two providers and one Board Member,” said Benjamin Flores, President & CEO of Ampla Health. 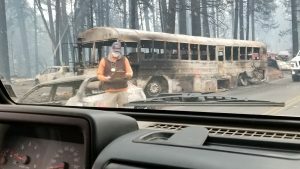 Now the health center is focused not only on recovery for the community — including the more than 27,000 residents of Paradise whose town has been razed by the fire– but also members of their staff. “Our Annual Awards Dinner & Holiday Event set for Saturday, December 8, will turn out to be the platform of fundraising for our 13 staff members and their families. Most of the prizes that are usually given out during this event will be donated to them. We are welcoming CASH donations from other staff members, before and during the event, as well as the kind support from other organizations, business and/or individuals. Anyone interested in doing so, is welcome to contact me directly at (530) 788-2748” said Rocío Valdez, Director of Communications at Ampla Health. CPCA has also sent out a link that lists wildfire resources for health centers and their patients. “CPCA remains committed to supporting health centers impacted by this tragedy and strongly encourage those not directly affected by the fires to support our health center family and communities as much as possible,” said Carmela Castellano-Garcia, Esq., CPCA President and CEO. As usual, our friends at Direct Relief have swung into action and are on the scene, sending supplies where there is a need. The international relief organization has sent over 100,000 n-95 masks as well as several oxygen concentrators and a range of medications for chronic conditions and other illnesses. “Direct Relief has a team in Butte County, and shipments are continuing to go out to affected areas,” according to Communications Director Tony Morain. We will keep you posted as developments continue.